Orders will be processed within 1-3 business days. Due to the high demand for Harpsicle® Harps build times to complete your order may vary depending on our current production schedule. We will try our best to complete your order as soon as possible without rushing the building process. Please understand that we are a small company and every harp is hand made to order. We apologize for the wait and greatly appreciate your patience. When your order has been completed and shipped we will notify you via email to let you know that your order is happily on its way. 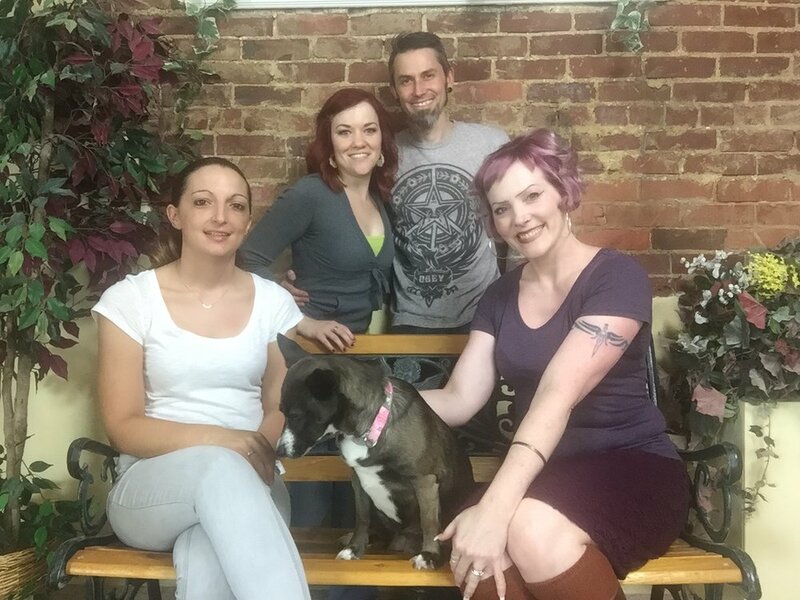 Rees customer support team: Ashley Rohrbach, Melissa Irwin, Piper (shown here prior to her unfortunate experience with a skunk), Garen Rees and Rebecca Brown. Shipping costs do not include taxes, duties, or other charges that may be incurred by your country's customs office upon arrival. These charges are the sole responsibility of the customer. Unfortunately, we do not know what these charges will be, as they are different for every country. For more information please contact your country's customs office. All International orders, excluding the Grand Harpsicle® Harp, ship via USPS Priority Mail International (terms are DDU - Delivery Duty Unpaid). Transit time is usually 6-10 days. Transit time may vary due to customs processing. Grand Harpsicle® Harp orders shipping Internationally ship via airfreight to the customer's closest international airport (terms are CIP - Carriage & Insurance Paid). This is the most economical way to ship a package of this size. The airfreight company will notify the consignee (receiving customer) when the harp arrives. Pickup from the airport is required and is the responsibility of the customer. Transit time is usually 6-10 days. Transit time may vary due to customs processing. If delivery to your door is needed, please contact us for a door to door quote. We will be happy to obtain a quote for you but, please understand that door to door quotes for a package of this size can be expensive. We understand that purchasing a harp and trying to decide between the many options can be overwhelming. That is why we are happy to answer any questions that you may have, and discuss the different options to help you decide which harp would be best for you. Please understand that making changes to the color or harp model after your order has been in process can cause a ripple effect in our production schedule causing us to get behind on other orders. Please be certain about these options before finalizing your order. Harp orders may be changed or cancelled within the first week the order is placed. After one week, cancellations are subject to a 10% restocking fee. Color changes made to harps are subject to a $25 fee after one week. Changing a levered harp to a Harpsicle® Harp will result in $25 fee after one week. Accessories can be changed or added to your order at anytime with no extra charge. There is no order change fee if you wish to add levers to a Sharpsicle® Harp or a Flatsicle® Harp. Once your order has been sent to the packing department no changes can be made. As a small family-owned business we are proud to stand behind our instruments and products to ensure quality and customer satisfaction. In the rare event that you may be unsatisfied with your harp or merchandise, please contact us within 10 days of receiving your items. Returns will not be excepted without prior consent from Rees Harps Inc. and are at the sole discretion of Rees Harps Inc..
Any merchandise other than harps, books, DVD's, and CD's that does not meet your expectations may be returned within 10 days of receiving your items in new condition and in the original packaging for a refund minus shipping charges. Books, DVDs, and CD's may not be returned unless defective, in which case we will exchange them for the same title. Harp returns must be in new condition and can be returned for a refund minus shipping charges and a 10% restocking fee. The customer is responsible for shipping charges both ways. Damage resulting from handling or inadequate packaging on the return will be the responsibility of the customer. We pack all of our items with great care but unfortunately items are sometimes damaged during shipment. If you receive a box that looks damaged, unpack it and carefully inspect your Items. Most of the time the items will be fine. In the event that you do receive an item that is damaged, contact us immediately for instructions and be sure to keep all of the original packaging. Due to carrier requirements the original packaging is required for inspection and insurance purposes. If you think something is missing from your order, look carefully inside any case pockets and re-check the packing materials. Accessories are often packed in smaller boxes that will be clearly labeled indicating the contents. Sometimes these boxes can become hidden under other packaging materials, so be sure to check everything carefully before discarding the packaging. If there is an item missing or a mistake with your order, please contact us within five days of receiving your order so that we can correct the mistake and get the items to you.